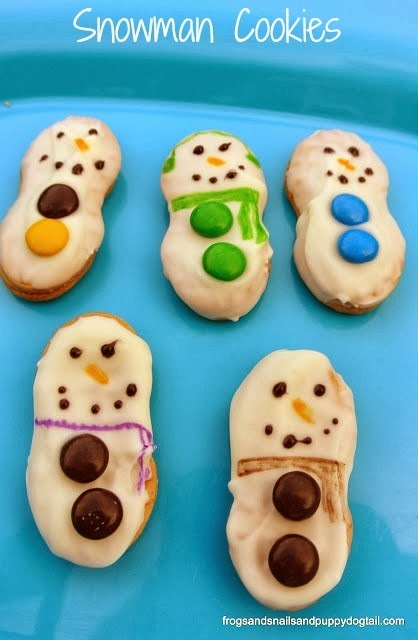 While hanging out on Pinterest one night trying to pin a few posts to different boards I came across the Nutter Butter Snowman cookies! I quickly fell in love. 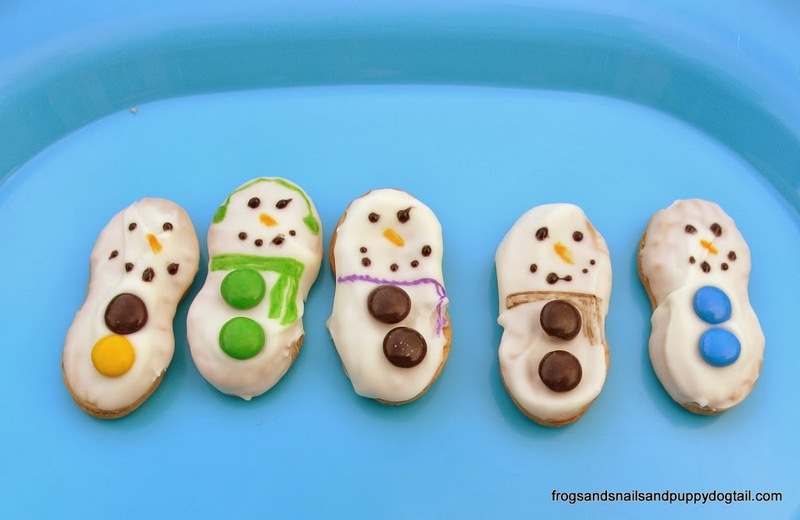 Two things I loved in one: snowmen and peanut butter. 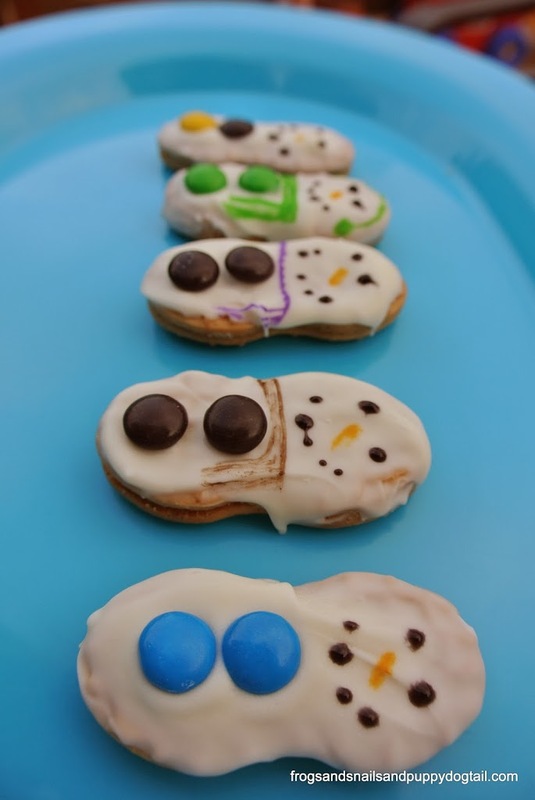 I mostly came across pins with photos only(boo) so I never found the originator of this wonderful snack. Maybe it has been around forever and I have just missed it while I live under my rock, lol. 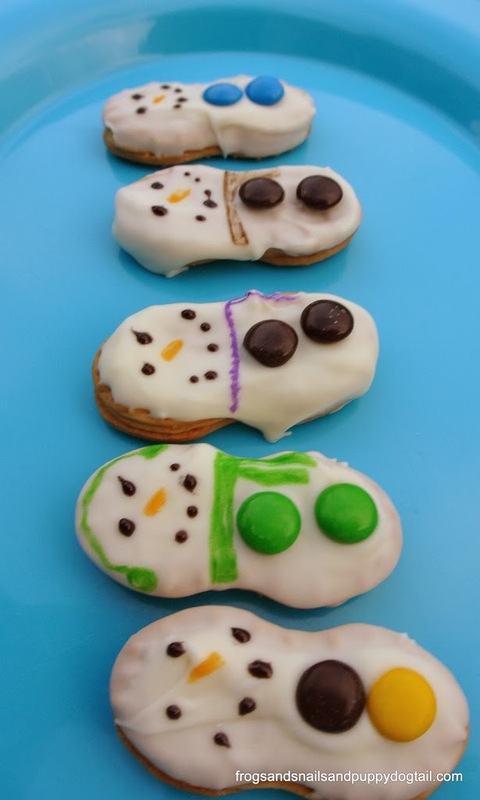 Here is the search for pinterest nutter butter cookies to try and give you a chance to look at other wonderful cookie creations from others. 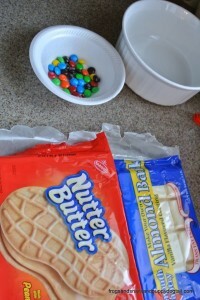 Nutter butters, M&Ms, almond bark, wax paper, bowl, and spoon. I melted the almond bark in the microwave. Once melted, I placed wax paper on the kitchen counter. Now the kids came back in, because when they saw cookies come out of the pantry they were not going far and kept running up to the counter begging to help( or eat a cookie) while the bark was melting. I dipped the nutter butter in the melted white chocolate and placed it on the wax paper. The kids added the M&Ms as buttons to the cookies. Then we left them to dry. Since these were off limits to the kids they both got a plain nutter butter. I came back later that day and decorated the cookies with food coloring markers and colored food gel. I gave them orange noses, black eyes and mouths. Then some got colorful scarfs and ear muffs. Now we had a fun snack to eat. 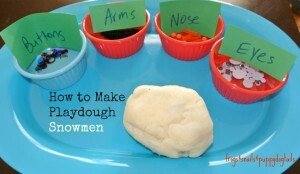 I must admit I would not let the boys eat one until I took pictures of them. I got busy after I made them. Oh, the ever growing laundry, the spilled juice, the “mommy I got to go to the bathroom”…. I completely forgot about the cookies. My sweet oldest son a few hours later said to me “mommy are you ever going to take a picture of those cookies. I really want to eat one.” So off mommy went to grab a few quick photos before the sun went down. 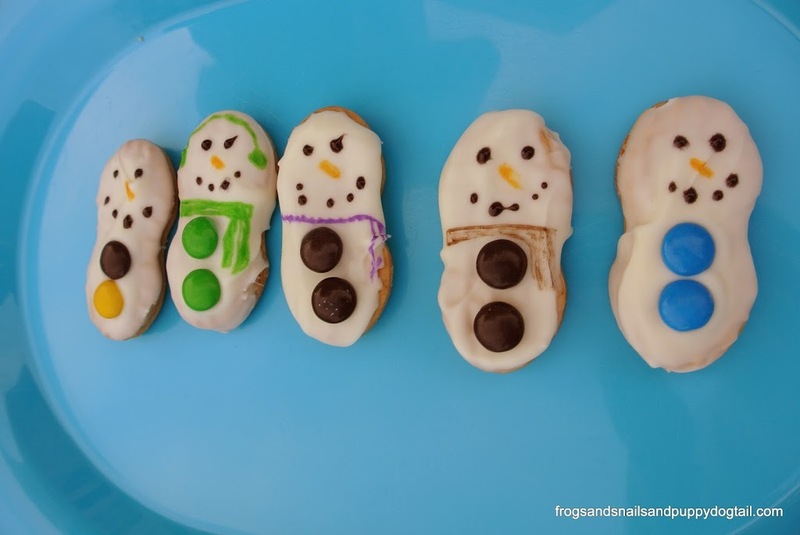 Now I have a few to share with you all on how our Snowman Cookies came out. Once again we had a snowman family of 5 just like our family. 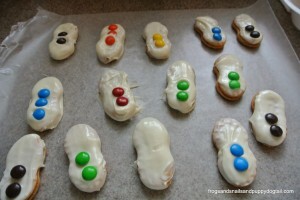 I will also admit that only half the cookies got decorated the other half just had to be enjoyed only dipped with M&Ms. 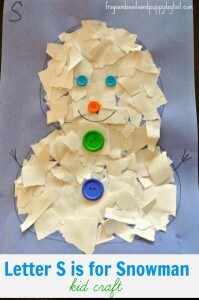 Either way, it was fun and pretty easy to do with the kids. 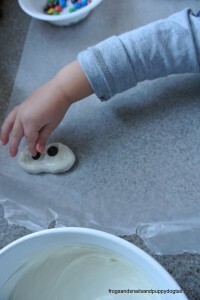 It was perfect for me as a busy mom, who never sits down to be able to work this activity in, to do with the kids. It didn’t take up much time and my boys 2yr and 5yr got to help and enjoy them. Hope you and your kids can enjoy them too. 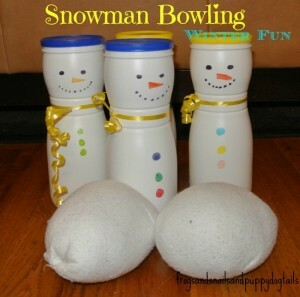 We have a few past post you may like Snowman bowling , Letter S for Snowman Craft, and Snowman from homemade Playdough. We made some last year! 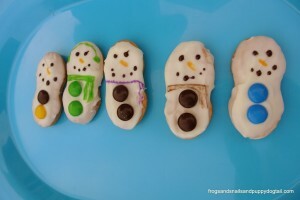 No idea who the first was though; they just looked like snowmen to me! 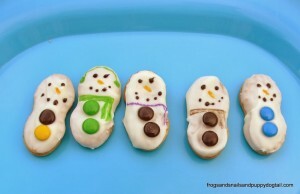 Ours are a little different though (http://lifewithmoorebabies.blogspot.com/2012/12/nutter-butter-snowmen.html).